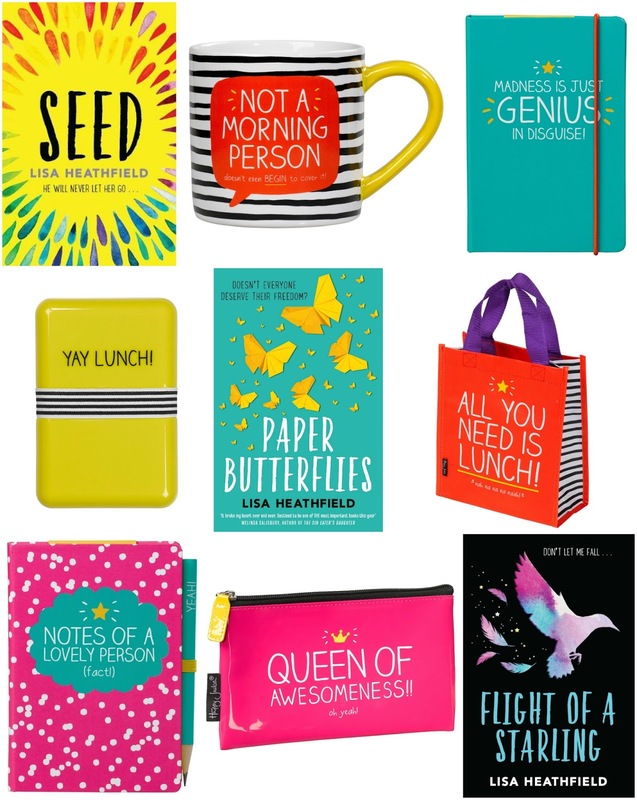 Enter this giveaway for a chance to win books by Lisa Heathfield and a Happy Jackson notebooks, lunch box, pouch, lunch tote and mug set. Good luck! Ohhh that's a tough question as it depends on so many things, but ultimately I think I prefer illustrated designs depicting a cozy scene that promises to be a heartwarming read. Hmm, hard to choose just one. But I'm really drawn to whimsical pastel scenes and colorful,fun cozies. I like book covers which pique my interest an give an idea of what is to come. I like covers with eye catching colours, a bold text and a strong background because they really capture my attention and make me want to pick up the book. I like dark and mysterious book covers because thats my favourite type of book. Book covers with a bright, colourful and original design which look aesthetically pleasing. "What kind of book covers do you like the most and why?" Something that looks intriguing and well designed. It might be abstract, but it has a disciplined geometry. Scenes of fantasy are great if the artist is hugely talented and the world shown is amazing. Chick lit covers should be fun and amusing. Its different with every book, but if it has a great composition and a catching color shceme then they are usually an okay for me. However when it comes to fantasy I prefer if there are no people/faces on the cover. I like covers that stand out and catch my eye.They make me want to read the book. Good question! Every book is different but I think if the cover is eye catching and I love the colors then they'll draw me to them, I'll know right away if I want to read the book or not; I really love young adult book covers because they tend to look really fun and beautiful. I like bright and colourful books covers. I think they stand out more. I rather paperback books. They are just easy to read in different positions and hold it. The last couple of books I have read have had pictures of scenery, one looked like an old landscape painting, the other was a black & white photo, yet both evoked a very clear sense of the places described on those books. That depends a lot on what type of book it is but generally speaking a cover with a link to the story line is always good. It depends on the book, but it has to catch my eye. love colourful bright ones, but also anything with a swordman/woman or dragons or anything hinting at fantasy!! It depends of the book, but I like colorful covers. I like covers with hard cover, like old books! I like book covers with bright colors or something pretty on the front like an animal or tree. I like book covers that really depict the story. And a cover that you can look at after youve read the book and can see more into the cover design. One that catches my eye. The ones with couples in them, or pets as well. I like covers with farm country or mountains in the background because it looks peaceful. I don't have a preference. I've never thought about it. I like it when they are unique, artistic, and colorful. I could say any, except for those build up guys. I'm kind of sick of those, lol. Colourful covers it makes me want to see what's inside. I don't know that I have a favorite type. It just needs to catch my attention. Ones that aren't embarrassing so I can read them anywhere. I like book covers with have cool designs and colors. Not really into the half naked man ones. I didn't think I really had a preference for book covers and spines, until I got a few black ones all in a row. I like my bookcase to look pretty, so I definitely prefer brightly coloured covers and spines. I love old fashioned book covers. Professional ones - I always think cheap covers let so many good self-published books down! My husband generally picks me anything pink or with sparkles/glitter on it, and I generally always enjoy reading them, but some of the best books I have read have got really boring covers on them!